Hunt 4 homeless – a local group of volunteers who provide weekend meals to those who are homeless and disadvantaged in the local community. 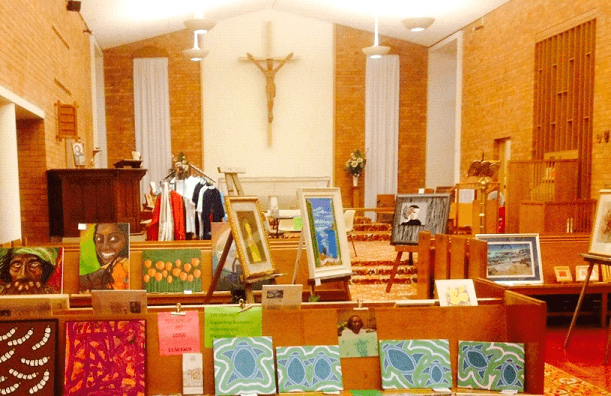 In June you are invited to come along and enjoy an evening at St Michael and All Angels with many local Artists, who come along to share their talent. This is an exciting and popular event. The funds raised from this event are donated to the New Farm Neighbourhood Centre. As a Patron of the Centre, this is the event that assists us to provide our annual financial commitment. The Art Show is also opened Saturday morning. We set up our courtyard café and serve Devonshire Teas and coffees to those who come to enjoy viewing the artwork. World Animal Day was started in 1931 at a convention of ecologists in Florence, as a way of highlighting the plight of endangered species. October 4 was chosen as World Animal Day, as it is the Feast Day of St Francis of Assisi – the patron saint of animals. 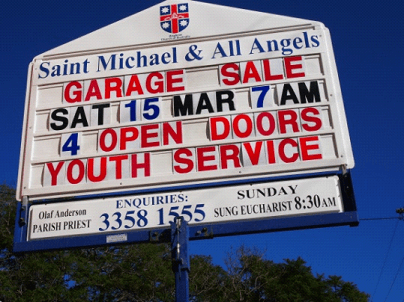 Here at St Michael and All Angels we acknowledge this day with a weekend of events. In the past, on the Saturday of the festival we have had a fair day with petting zoo, sausage sizzle, arts and crafts and an RSPCA promotional stand. The Sunday of the festival is a celebration of St Francis, with a blessing of the animals. This is a wonderful event where many from the community come along with their furry friends to receive a blessing. All funds raised over this weekend are donated to the RSPCA.